Ray has some pretty awesome powers, but I wouldn’t let him design an outfit. That was my main thought the entire time he and the other Leaguers were dressed in that hard-light armor. I got what they were going for, but Frost looked especially silly in what should be a serious moment. Character designs aside, I enjoyed this issue quite a lot. 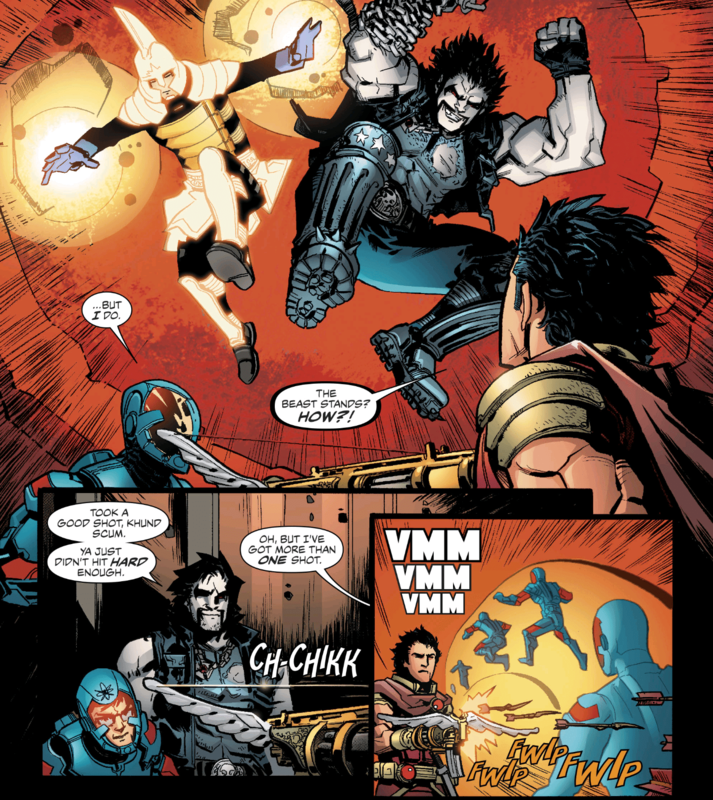 Lobo was the stand-out team member this time. He acted as kind of a mentor to the two greenest members, Ray and Atom. I enjoyed his interactions with both, as ultimately it was the three of them who put an end to the threat. 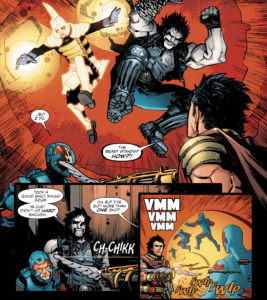 Lobo gives some good advice, when the moment calls for it. He has turned into the destructive, rebellious, and inappropriate big brother of the team. 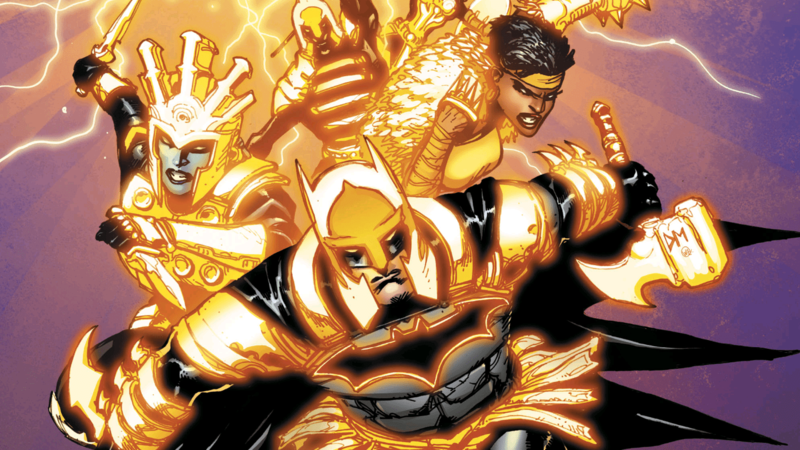 We are also introduced to who might be the newest member of the JLA (maybe when Batman steps down, like I’m still convinced he will): Xenos. He was the man responsible for building Aegeus’s weapons. In the last issue, he just seemed like a disgruntled sidekick, but we learn here that he is actually working for Aegeus in order to protect his own village. He and Ray seem to form a nice bond, and they both have a knack for terrible design choices. I do hope he sticks around for longer than an issue or two. Overall, I don’t see this comic as anything groundbreaking, but it’s still fun. It still says important things, even if it never digs very deep into them. When the country or town is saved, the JLA does take the time to make sure they help pick up the pieces. They use the resources at their disposal, and their public personas, to make a difference – like heroes in the real world should. Not everyone can be like Mari, or Bruce, and build branches of their billionaire businesses in every struggling town (and that does present some problems of its own). But an attempt was made to address this kind of real-world issue, and I appreciate that. 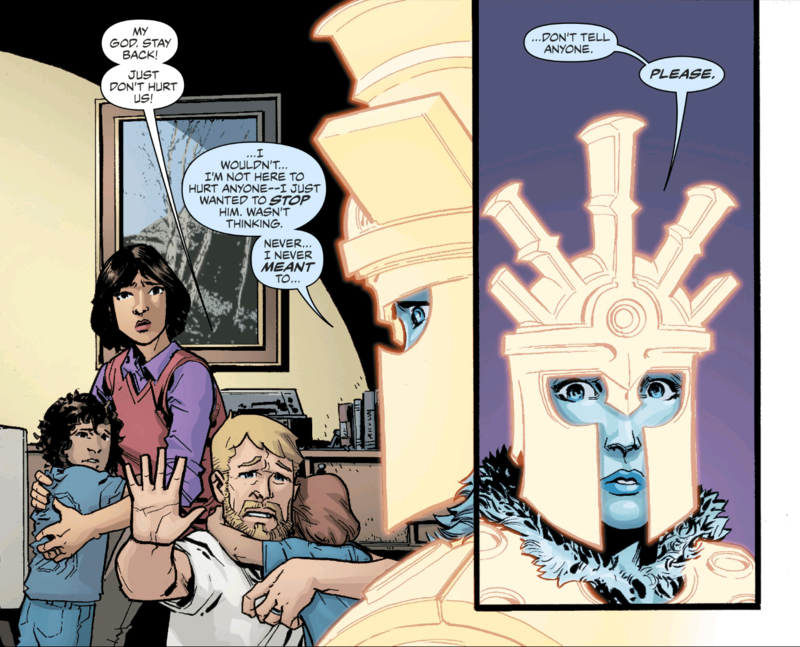 It appears the next issue will be digging deeper into Frost and possibly curing her illness. Do I think it has any chance of success? No, but I hope it comes with a great examination of her character, and Atoms, as they make the attempt.